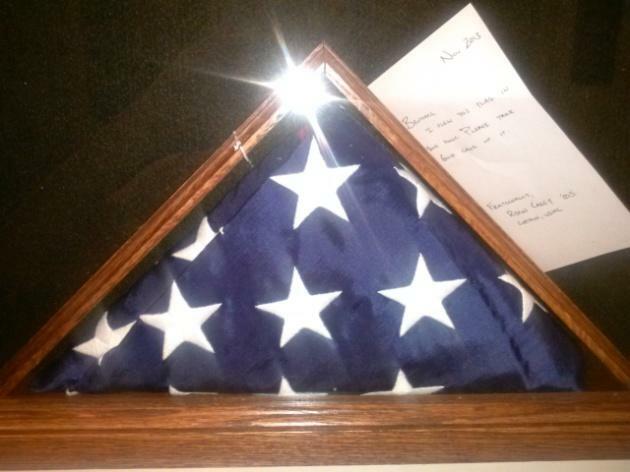 In August of 2013 Alumnus Brother, Captain Ryan Casey ’05 of the US Marine Corps donated to the chapter an American flag. This flag is of particular significance as it was flown in Afghanistan in honor of Theta Chi, Epsilon Chapter by Captain Casey and his fellow members of helicopter squadron 167. Captain Casey has donated the flag with a certificate of its significance to the chapter for safe keeping. 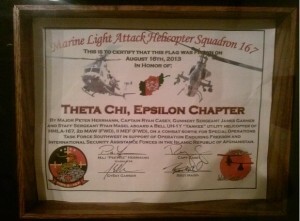 It is currently on display in the alumni room at the chapter house along with other items of importance to the chapter. We of the EBA and the brotherhood thank Ryan for his generous gift and service in the US Marine Corps.